Penguins are a group of aquatic, flightless birds. They slide on their bellies across the snow, congregate on icebergs and seem to fly through freezing water in search of fish. That’s how most people picture penguins, in Antarctica. The Galapagos Islands, New Zealand and South Africa are three other places where you can see penguins in their natural habitat. 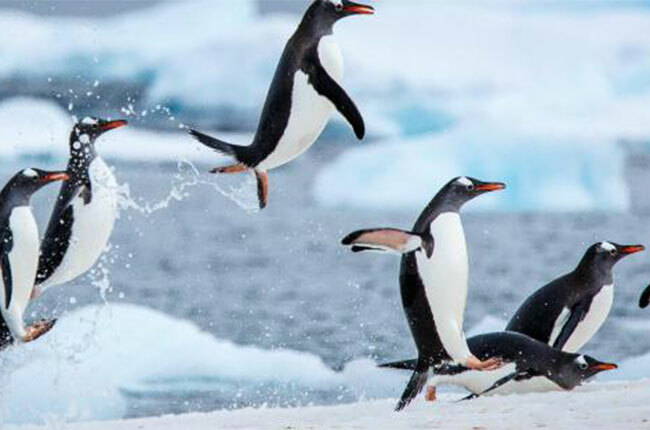 AntarcticaIf you go on a voyage through Antarctica, a highlight is zooming through the icy water in Zodiac landing craft to observe loud colonies of chinstrap, emperor, Gentoo and Adelie penguins. Chinstrap penguins are named for the narrow black band under their heads, and Gentoo penguins have white straps across the top of their heads. Emperor penguins can be identified by the pale yellow coloring of their ears and breasts, and Adelie penguins by their tuxedo-like appearance. The Galapagos IslandsThe Galapagos penguin is the rarest species of penguin and is the only one found north of the equator in the wild. They are observed primarily on Fernandina and Isabela islands, thought they also hunt huge schools of fish just offshore of Bartolome Island. Cruising by panga (motorized boat) along Punta Moreno provide opportunities to look for penguins. Snorkeling around Sombrero Chino Island, you may also encounter a resident penguin family. New ZealandSeveral penguin species are unique to New Zealand and the Oceana region. The blue penguin is the world’s smallest penguin and is named for its unique color. Crested penguins are known for their brush-like feathers on their heads. As the name would suggest, yellow-eyed penguins have distinctive ashy eyes and stripe that runs around the back of its head. The penguins can be found around the South and Stewart islands; a cruise in Milford Sound provides the perfect viewing opportunity. South AfricaIn 1982, a colony of African penguins settled on Boulders Beach in Cape Town. The colony of 3,000 penguins is now one of the mainland penguin colonies. African penguins have a black stripe and black spots on their chests. The pattern of spots is unique to each penguin, like a human fingerprint. These penguins roam freely on the beach, allowing for close encounters as you walk among the beach’s granite boulders.